MIXING WEEK: Even with years of mixing experience and an ultra-precise monitoring setup, getting the low frequencies working perfectly within a track is never easy. Every record is different: some productions partner a thunderous kick drum with a funky low-mid bass; others keep the kick light and allow the bassline to be the low-end shining star; while others pass primary sub duties between both the kick and bass somehow. If a perfect kick and bass combination is on your agenda, those two elements need to fit together like a glove. But how the other parts in your track interact also plays an essential role in defining the mix. Pile in too many midrange sounds (such as vocals, guitars and synths), and the listener will be distracted from the bass; whereas a minimal mix will allow the bass to breathe and cut through. Similarly, brighten drums or vocals too much, and the entire focus of the mix will be shifted away from the low-end. Reference against your favourite bass-heavy tunes and dissect the overall balance, not just the bass. Depending upon your monitoring, it can be tough to decipher the key of the kick drum. To solve that, simply throw a saturation plugin on the kick, overdrive it to hell, then audition its bloated, tonal timbre against the melodic parts in your track. The actual note it's playing should immediately become apparent. Sub bass energy eats up headroom, and you need headroom to make a mix loud. Ironically, genres that call for powerful, exaggerated bass are often the ones that must be made to appear loud. It’s a struggle even for experienced mixing and mastering engineers. As a general rule, the louder a track’s sub frequencies, the less limiting you can apply before distortion. So if you want a huge bottom-end, you’re probably going to have to sacrifice a few dB of gain reduction on that master maximiser; likewise, if supreme loudness is your goal, you may have to rein in sub frequencies so you can push the limiter harder. Sub bass is non-directional, and most clubs output a mono signal, so keep subs centrally positioned for maximum low-end power and focus. Widen a high-passed parallel signal to give your sub width. Most bass mixing advice is easy to recite, but true mixing ninjas can put these tricks into practice in an assertive way - or even ignore them when the situation dictates. For example, you might have a bass-heavy kick and high-pass-filter your bassline to sit above it - as everyone advises - but then the bass is left sounding weedy and thin. Now what? An expert will have the skill to pull that filter back to the perfect frequency, adjust the kick’s length accordingly, tweak timings and tunings, or just ditch sounds that aren’t working and find something better. Our point? It’s all about split-second decision-making: action, assessment and reaction. Use an analogue-style high-pass filter to remove unwanted sub frequencies from a bass part, then overdrive the filter to create warmth and emphasis around the cutoff point. 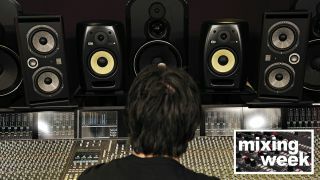 Following tip 5, mixing experience will teach you when production rules can be broken. We’re always told to separate kick and bass, but you might be producing a raw, lo-fi genre that demands a homogenous, ‘muddy’, analogue sound. Here you might have more success by melding the kick and bass together with parallel processing, compression or even distortion. Or, you might find that a widened bass translates better than you thought it would in the club, despite traditional mixing rules. Only experimentation and experience will guide you to stylistic choices that suit your own aesthetic. When synthesising sub bass, start and end clicks at non-zero crossings are annoying. Raising the amp envelope attack and release can relieve those pops a bit but might also remove front-end impact. The best - but most time-consuming - solution is to bounce your sub part to audio, then chop and fade the edges to remove clicks.